The loss of a family pet is often a child’s first experience of death, and and it can be crushing. So when her family’s beloved beagle died, mum Mary Westbrook devised a special ritual to help three-year-old son Luke cope with his grief. 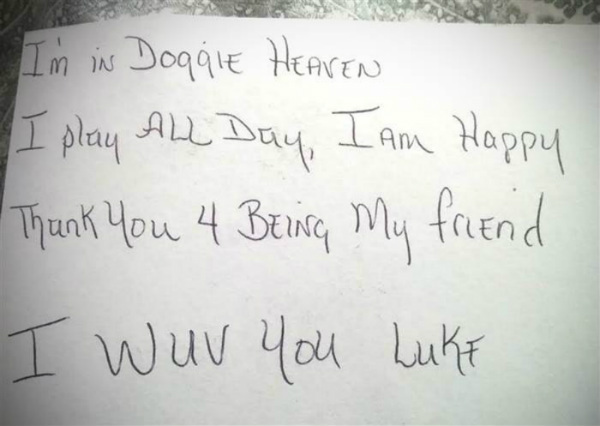 For months after Moe’s death in April, Ms Westbrook and Luke would sit down every night to write messages to him. They addressed the envelopes to “Doggie Heaven, Cloud 1”. They posted each letter in their mailbox “because you can’t fool a three-year-old”, Ms Westbrook writes in Distinction magazine. She usually fished the letter back out later in the day, but one day forgot to collect it. She figured it would be thrown out by postal workers. The Virginian-Pilot newspaper tracked down the author of the letter after Ms Westbrook posted the note on Facebook. She tells the paper Luke’s letter carried an innocence that “made my day, so I wanted to make his. It’s just love, plain and simple”.